A well-rounded treatment plan for arthritis includes a healthy dose of summer fun—and making sure that when you are doing outdoor activities, you are taking care of your body by eating well, maintaining a healthy body weight, and doing the right kinds of exercise. According to the Arthritis Research Centre of Canada (ARC), there are many benefits to outdoor summer exercise for someone living with arthritis. 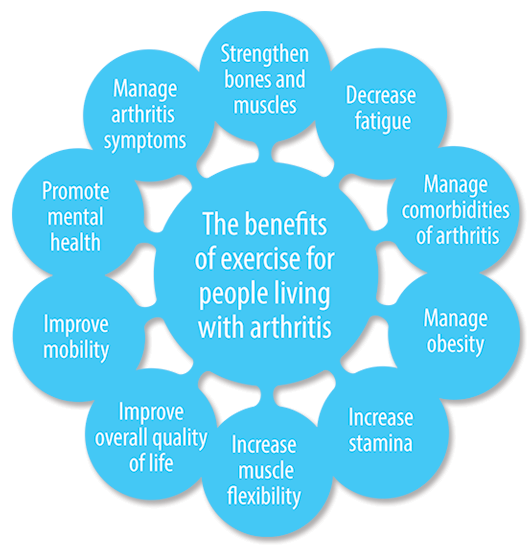 Though it may be difficult and daunting at first, exercise is important if you live with the joint pain and stiffness of arthritis. After all, your bodies are naturally designed for moving. Cheryl Koehn, President of Arthritis Consumer Experts (ACE), is an avid tennis player. She's been playing tennis since she was a kid, and for the last 23 years, with rheumatoid arthritis (RA). In an interview, Cheryl tells us why she loves and continue enjoy playing, even after multiple joint surgeries and permanent joint damage. Q: Why do you love playing tennis? Cheryl: I've wanted to play tennis since I was a kid growing up in Southern California. Chris Evert was my idol, and I had dreams of becoming a professional and going on tour. I'm not sure how I made the mental leap from banging a ball against the garage door and hoisting the Wimbledon trophy, but I did. But back in my day, tennis was a country club sport, so when I started playing freshman high school volleyball and was good at it, I played the sport that I and my family could afford. It was so great picking tennis back up after my life with volleyball. Q: How can you play tennis safely with arthritis? Cheryl: I'm not certain everyone can; I think it really depends on their level of disease activity, general overall fitness, and of course, joint health and mobility. But I always think if there is a will there is a way. Look at para-athletes. There are unreal players around the world who have limited to no use of half their body playing highly competitive tennis—I know I've been humbled playing against these athletes in tournaments. Another inspiration is 34 year old Venus Williams who made it to the Rogers Cup final in Montreal this month. Venus is again playing at a high performance level thanks to medication and extra rest to control her Sjögren's Syndrome—an auto-immune disease she was first diagnosed with in 2011. I follow the same routine to prepare before I play. I tape my wrists as they are mostly fused and I have ongoing tendon inflammation in them. I also have cushy insoles in my tennis shoes, use a fairly light racket to make serving and volleying easier (when I can make it into the net!) and I always take a dose of acetaminophen (eg. Tylenol) before I play to help with mild to moderate pain after I play. I also like to go for a swim in the ocean afterwards. It's like taking a big ice bath and has wonderful anti-inflammatory effects for me. Preparing for any physical activity or sport is different from person to person, whether you have arthritis or not. So the things I suggest, work for me, but may not for someone else. The bottom line is never say never. Try to modify or prepare in order to do something you love. Q: What is tennis elbow and will I get it from playing tennis? Cheryl: Not many people know that tennis elbow isn't really something brought on by tennis, at least not for the majority who get it. Its medical term is lateral epicondylitis, a condition caused by either abrupt or subtle injury of the muscle and tendon area around the outside of the elbow. It is often associated with overuse of the arm, forearm, and hand muscles, resulting in elbow pain. According to The Canadian Centre for Occupational Health and Safety, the term "tennis elbow" is misleading, as most people who develop it didn't get it from playing tennis. Research shows that less than 5% of all tennis elbow cases are related to playing tennis. The term "lawn-tennis elbow" dates back to an article by H.P. Majors in The British Journal of Sports Medicine in 1883. Playing golf with a bad back is giving PGA professionals a "pain in the neck" as musculoskeletal (MSK) related pain is taking its toll on current golf professionals. Leading the way is perhaps the greatest golfer of all time, Tiger Woods, who has struggled for years with back pain and is coming back after back surgery on March 31. At the PGA Championship this August, other big names from the PGA Tour have had to withdraw from the golf season's last Major tournament of the year, including Matt Kuchar, David Toms, Ben Crane, and Jason Dufner, due to back pain. MSK-related and back pain is not limited to PGA professionals; it is a common problem for everyone. Ninety per cent of Canadian adults experience it at some point in their lives. What can you do to play golf regularly and maintain a decent level of performance? Look no further than Phil Michelson who was diagnosed with psoriatic arthritis in 2010. Thanks to an early diagnosis and with the help of arthritis medications, a healthy diet and plenty of exercise, Mickelson continues to play world-class golf, most recently finishing second in this month's PGA Championship. Warm up before you golf. Get a golf bag with wheels so you can roll it around the course instead of carrying it. Wear gloves to maintain a steady grip on your club without increasing pressure. Use clubs with lightweight graphite shafts and perimeter-weighted heads. This will help absorb shock. Use golf balls with lower compression. Adjust your swing style and alternate between the classic swing and the reverse-C swing. End the game early to prevent back, shoulder, and elbow injuries. Play from 150-yard markers to minimize the distance of your swing. Helgi Olafson, a Canadian born health activist and amateur endurance athlete living with ankylosing spondylitis (AS), ranked 43rd in the United States for the 2013 Ironman 70.3 triathlon in the 30-34 age group. Helgi was diagnosed with AS in 2001 and did not start his training to become a professional triathlete until 2012. His goal is to compete in Ironman World Championships on The Big Island of Hawaii. As part of his training, he bikes a couple hundred miles, runs 30-40 miles, and swims around 5 miles per week. He wants to inspire people with arthritis to live a healthy life through stretching, routine exercise, nutrition, maintaining a positive attitude, and listening to their bodies. To optimize your biking experience, you should visit a bicycle shop to find the right bike size for your body frame. Test ride the bike to ensure you are comfortable on it. What and where you plan to bike helps you determine what type of bike to get—cruiser (city) bike, mountain bike, or hybrid bike. A cruiser bike is suitable for recreational riding on a smooth and flat terrain and has higher handlebars and lower seats. A mountain bike is designed with wide tires with heavy treads for cycling on off-the-beaten-path trails. It has a thicker frame and includes suspensions, which provides better stability. A hybrid bike is a bike that combines the features of both a cruiser and a mountain bike. If you are uncertain about biking outdoor, stationary cycling provides the same benefit of biking—getting a cardiovascular workout without stressing your weight-bearing joints. Over time, people with osteoarthritis and rheumatoid arthritis lose the ability to balance due to living a sedentary lifestyle. Stationary cycling helps these people get the exercise they need and minimizes the risk of injury. Whether you are going camping or travelling to a new country or city this summer, there are ways to do so in an arthritis-friendly way. We discussed aspects of travelling with arthritis with Linda Wilheim, a mother, grandmother, outdoor enthusiast and arthritis advocate living with rheumatoid arthritis. In Canada, summer outdoor adventures like camping, fishing and hiking are often just a short drive away. Being prepared is the key to a successful road trip. Linda Willheim shares her game plan for travelling with arthritis. Q: What do you do on long car/airplane/train rides to ease your arthritis pain? Linda: Generally, my flights are never longer than two hours. Every flight I take that is longer than two hours must connect in Toronto or Montreal so that gives me some time to stretch my legs. For the rare ones that are longer, I get up and walk around every hour and a half. I have had experiences where, after a long day of meetings, it has been very difficult to even sit in a plane for the 2-hour flight because I am so sore. I take some pain medications and do some stretches in my seat, grit my teeth and look forward to landing at my destination which is usually home so that keeps me going! For cars (and motorcycles), my preferred way to travel, it is much easier. We usually stop every two hours for a break, grab a coffee, meal or just take a walk and enjoy the scenery wherever we are, never driving more than 6-7 hours in a day before stopping for the night. We also have an RV and travelling with it is more enjoyable as we stop at nice rest areas along the way and can cook meals instead of eating out, restaurant food starts to taste the same after a while. We also have our own bathroom, which is great when you are stuck in a traffic jam. We had a wonderful trip to Ontario this year from the east coast with our 9 months old grandson and our daughter with the RV. The key is to be flexible and take breaks when necessary. Make the journey part of the vacation, not just a means to get there. Q: How do you keep a road trip stress free when travelling with children? Linda: Try and plan your drive around naps so they sleep for some of the trip, have toys, games, music, snacks, and take breaks every few hours in places where they can play. As naps are unpredictable, keep your itinerary flexible. Q: What tips do you have for ACE consumers planning a trip or wishing to do outdoor activities such as hiking and camping? Don't travel alone, have someone with you who knows your limitations. Wear good, comfortable hiking boots and shoes. Have sunscreen, bug repellent, a hat, sweatshirt, and water. Whether you are camping in a tent or RV, you can enjoy the beautiful outdoors with a comfortable bed, pillow, and if you are in an RV, a bathroom/shower. Build up to hiking, start with the easier trails. They are usually graded. Taking on a trail that is too difficult for your skill level can get you in trouble. Time your pain medications for their most effectiveness. Be aware of your surroundings, watch where you are walking as one fall can ruin a good time (I speak from experience here). Pace yourself, take activities that also allow for rest; my Kindle is irreplaceable and nothing beats sitting around a campfire after a day of camping. With summer still here that means there's still time to get in a good read or video for the beach or poolside. What about a book or movie featuring characters who live with arthritis? Not just for arthritis consumers, but also for their friends and family, reading or watching a fictional story can improve understanding and empathy by leading you to feel the emotions, thoughts, beliefs and internal responses of characters living with arthritis as if they were their own. For example, we learn about the inner strength of Oscar award winner Juliette Binoche's character in the 2014 film, Words and Pictures, as we see her deal with the challenges she faces as an artist and painter living with rheumatoid arthritis (RA). In her Roman a clef, Modern Art, author Evelyn Toynton creates a story that closely parallels the real life of Lee Krasner, the wife of the painter Jackson Pollock, through the novel's fictional main character, Belle Prokoff, who is living with severe arthritis. In John Steinbeck's East of Eden, he portrays Cathy Ames, the wife of the main protagonist, who struggles physically and emotionally after developing arthritis in her hands. The movie The Curious Case of Benjamin Button, released in 2008, won 3 Oscars and stars Brad Pitt as Benjamin Button. Although the disease Benjamin Button has is fictional, it resembles a rare genetic disorder called Progeria in which young people appear old. People affected with this disorder generally have severe rheumatoid arthritis. And of course, there are many non-fictional books that deal with arthritis. From personal to research based, they offer personal perspectives and educational information. A great place to start is Rheumatoid Arthritis: Plan to Win, written by our very own Cheryl Koehn, along with Taysha Palmer and Dr. John Esdaile, which offers an inspiring, scientifically based game plan for minimizing the effects of RA, and ultimately, achieving optimal health. Two other books to consider are Good Living with Rheumatoid Arthritis by the Arthritis Foundation and Get a Grip: A Take-Charge Approach to Living with Arthritis by Amye L. Leong. Arthritis Consumer Experts (ACE) and the Arthritis Research Centre of Canada is pleased to announce updates to the ArthritisID and ArthritisID PRO apps–just in time for Arthritis Awareness Month in Canada in September. For the update, ACE has improved the way information is visualized on the screen and added more links to resources that will provide you with relevant information about topics that you care about. The ArthritisID app is the most comprehensive free arthritis app for consumers, featuring the most current, evidence-based arthritis information to help detect, treat, and manage arthritis. Included in the app is a screening test for arthritis, which you can save and share with friends and healthcare professionals. The app helps you understand arthritis better and features treatment strategies and medication information for osteoarthritis, rheumatoid arthritis, ankylosing spondylitis, psoriatic arthritis, lupus, gout, and juvenile idiopathic arthritis. ArthritisID PRO is designed for healthcare professionals and includes everything that the ArthritisID app has. The app features Continuing Medical Education (CME) activity accredited by the College of Family Physicians of Canada (CFPC) providing Mainpro® M2 Credits. There are also five instructional arthritis joint exam videos presented by North America's leading rheumatologists. ArthritisID and ArthritisID PRO, available in English and French, do not require an internet connection to operate. Download the ArthritisID app and ArthritisID PRO app now. Share the app with a friend in the "Tell a friend" feature and help promote awareness for arthritis this September. Over the past 12 months, ACE received unrestricted grants-in-aid from: AbbVie Corporation, Amgen Canada, Arthritis Research Centre of Canada, BIOTECanada, Bristol-Myers Squibb Canada, Canadian Institutes of Health Research, the Canadian Rheumatology Research Consortium, Celgene Inc., GlaxoSmithKline, Hoffman-La Roche Canada Ltd., Janssen Inc., Pfizer Canada, Purdue Pharma L.P., St. Paul's Hospital and the University of British Columbia. ACE also receives unsolicited donations from its community members (people with arthritis) across Canada.